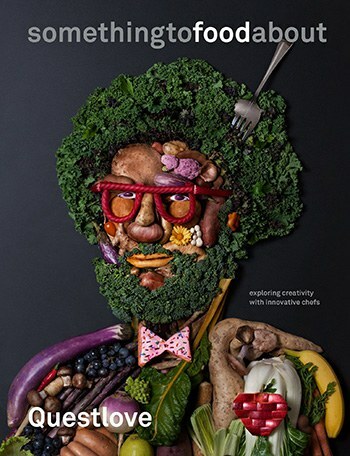 Questlove’s Somethingtofoodabout showcases how the performing arts necessitate a different kind of creativity. Ours is a Late Show household, but we did watch Jimmy Fallon for the short window between Letterman and Colbert. The thing about Fallon’s show that never failed for me was the Roots; Fallon has an amazing, intelligent band. Questlove’s passion for food was sometimes allowed to shine through when there were food-related guests in middle or minor segments of the show, and I came to appreciate him not only as a bandleader, but as a student of popular culture at large. You make the dish, it gets eaten, then what is there? People who are gifted at one particular art often attempt to leap into another form and fail miserably there. Questlove seems capable of being successfully interested in more than one thing at a time, so my interest was piqued when I heard about Somethingtofoodabout. At the same time, however, I was intensely concerned that he might not be up for doing a book that I found rigorous enough in its study of food. This goes back to my main grievance with Fallon; he’s just so nice. He tells every guest that their newest thing is super duper maximum great and mind-blowing. It’s the late night equivalent of a safe space; I prefer interviewing that achieves somewhat more critical distance. Questlove sits through that kind of talk five nights a week, and as a giant celebrity himself, would surely garner a wealth of positive publicity over Somethingtofoodabout, whether the book genuinely deserved it of not. So let me assure readers of this review that I approached this book with a rather severe degree of skepticism in addition to the high bar that I always try to set for thinking and talking about food. Despite these concerns, I have to admit to being mightily impressed with Questlove’s work here. I don’t know to what extent these interviews have been edited for content or for space, and of course the book is credited to Questlove “with Ben Greenman” just as Mo’ Meta Blues: The World According to Questlove was. Still, it’s Questlove’s personality shining throughout each chapter and he successfully collaborates with his ten interviewees to produce a conversation that digs deeply into the nature of creative enterprise. Though he doesn't have an academic food vocabulary at his disposal, Questlove’s wealth of travel experience affords him a strong sense of the big picture for food trends and challenges. He challenges both himself and his interviewees to engage these larger threads with solid results. Each chapter begins with one page of Questlove’s background information on the interviewees -- how he first encountered them, what their restaurants are like, what sort of ideas appear to be coming out of their kitchens. The interviews then each take up five or six pages in a two-column spread. The physical design of this book is wonderfully spacious in this regard. The text is a two-column spread on each page, with a third somewhat skinnier column at the margins. Into this third column, Questlove usually drops a footnote that takes up less than a third of the total column space, meaning readers have several square inches of white space per page into which they may drop their own annotations. After each interview, there's a series of photographs that capture some aspect of the interview; they show the kitchens, or the machines, or beautifully plated food, sometimes scenes from the interviewee’s domestic life or Questlove animatedly eating witht his friends at the interviewee’s restaurant. There is a lot of white space for note-taking around these visuals, too. Kyoko Hamada’s photography is itself gorgeously stark, a modernist sensibility of cleanliness in the lines plus a vibrant field of colors reminiscent of her commercial work for Japanese clothier Uniqlo and Swiss furniture maker Vitra. The interviews themselves appear to have been conducted in the order that they are published in the book, as Questlove is fond of referencing things said by previous interviewees and asking the next person in line to provide commentary on the original comment. This allows the concepts on Questlove’s mind to continually resurface for a reflection that shifts, builds, and deepens with each chapter. There are a few topics consistently on his mind. The most obvious is a mapping of the creative process. There are repeated comparisons made between cookbooks and sheet music, and an inquiry into whether these are simply lifeless artifacts. Questlove is also invested in many different types of shortages, e.g., why food deserts exist in urban areas, why famines are still possible, whether some foods can ever be produced sustainably, how hunting impacts an animal population, why cheffing is dominated by white males. He also asks more personal questions that speculate not on the future of food but instead portray something about its past. Each interviewee has a unique set of present tense concerns, but Questlove always ends up asking them to describe the first restaurant they ever went to when they were kids. The answers here are diverse, compelling, shot through with sense memory and some of the most telling portraits of these interviewees’ roots. Most of the interviewees are good at talking about what they do. Daniel Humm, of Eleven Madison Park in New York, continually proves himself articulate about his own work. Dave Beran, of Next in Chicago, stands out for his brutally clear evaluation of what makes a dish a success and what to do with success. Jesse Griffiths, of Dai Due in Austin, have a nuanced and persuasive understanding of how to be a progressive and a hunter at the same time. Donald Link, of Cochon in New Orleans, press for finer distinctions within tourists’ caricature of Cajun and Creole cuisines. Then there’s Nathan Myhrvold, of Modernist Cuisine lab in Seattle. This is the first interview, and it admirably jumps right into the meat of many big ideas. Perhaps one of the best ideas this book puts forth is the challenge of all performing arts endeavors: you make the dish, it gets eaten, then what is there? Art forms that are experiences, whether a Roots concert or dinner at Trois Mec, really have only the sense memory of those points in time and the emotional residue those memories produce. Maybe there’s a concert DVD or a menu you can take home, but it’s not the same as living in and through the moment when the art is taking place and you are right there engaging with it. It’s not the same as a shelf full of classic books or a city full of cool architecture. The performing arts therefore necessitate a different manner of creativity, and Questlove doesn't shy away from either the joy or the terror of this fact. Then end of the book circles back around to Myhrvold, who makes Questlove a 13-course lunch. It’s wise to include this last, so that readers can read the meal substantially more deeply based on the ideas they’ve picked up from the ten interviews. This meal is rendered first as photographs, and then Questlove’s first impressions of each dish followed by what Myhrvold says as he presents each dish. This section provides an immediate practice space and proving ground for readers to give their thoughts on food some fresh exercise. It's an invigorating last chapter, and Questlove includes a “song pairing” for each dish that reconnects readers to his primary art form and reminds readers of why they love Questlove in the first place. I expected to dislike this book, but found myself unable to muster any substantive criticisms of it that would be enough to outweigh its usefulness. Some interviews are better than others, Anthony Bourdain phones in the introduction, and Questlove’s conclusion segment is a little cheesy because he's being forced to give closure on something that is, of course, unending. Still, all kinds of artists will find a lot of provocative concepts in Somethingtofoodabout. The food discussion never veers into territory so elitist or so technical that an ordinary person who enjoys ordinary restaurants would miss the point. There's a lot of good music and visual art discussed here. There are important predictions for the future of farming and the food industry that do plenty of head-on tackling of key issues surrounding race, gender, poverty and the environment. This book is meant to create conversation and thereby induce creativity. It succeeds on that level without dumbing anything down, so please don’t think I’m simply giving it the Fallon treatment when I say that Spmethingtofoodabout is a really good read.